"Essential" oils are aromatic liquids extracted from plant parts that carry the plant's unique essence, as well as many of its healthy compounds. Honey Candles® line of essential votives are made with 100% pure beeswax, gently infused with natural and healthy essential oils for a light home fragrance, hand made in Canada. Using only safe and environmentally-friendly ingredients: no solvents, heavy metals, nor any other toxins commonly found in candles. Great for your health, beeswax candles emit distinct compounds when they burn, neutralizing airborne contaminants and allergens. No wonder they've been recommended by the American Lung Association. 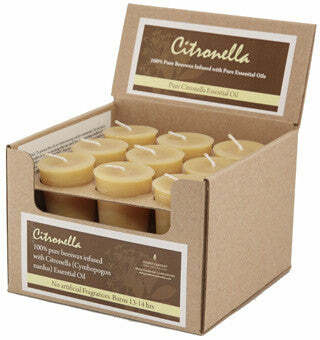 Better yet, beeswax candles produce a natural glow that closely resembles sunlight. LAVENDER: A unique combination of lavender and sweet orange makes for a soothing votive candle that is both citrusy and flowery. A dash of black pepper adds a subtle spicy touch to make a one-of-a-kind beeswax votive candle. MULLED SPICE: A gentle fusion of cinnamon, cloves, nutmeg and ginger essential oils, Honey Candles® mulled spice votive is guaranteed to soothe, and add warmth to any room. EVENING BLOOM: Honey Candles® Evening Bloom votive is an infusion of ylang ylang and rosewood essential oils inspired by a floral breeze on a warm summer evening. The "flower of flowers", ylang ylang is an ancient secret of Eastern Asia, used in aromatherapy to relieve blood pressure and improve skin condition, among other benefits. Mixed with the gentle scent of rosewood, Honey Candles® Essential Votive Evening Bloom is sure to delight your senses.